A Dior bow is a narrow but full bow. It works well on an oblong or rectangle package as well as on a barrette as a hair bow. The width of the ribbon you choose is the deciding factor for how wide your finished bow will be while the number of loops and loop placement decide the length of the bow. To create this bow, you can make your own ribbon out of almost any fabric to match any outfit or handbag. If you are using a fabric such a vinyl to make a pocketbook, you can glue two layers of the vinyl and cut it into strips the desired width of the bow and embellish the pocketbook or purse. Check the clearance racks for remnants of ribbon, lace, and trim that might make a bow to meet your needs. Free Ribbon Resources are great ways to collect ribbon. Experiment with those scraps that were too big to throw away and create bows for packages, outfits and embellishing. The weight of your fabric will have a large part in the method you will use to create fabric ribbon. This method works well for light to medium weight fabric. Pre-wash or pre-shrink the fabric to remove the sizing and manufacturing finishes. Iron the fabric smooth and wrinkle-free. Apply fusible web to the wrong side of the fabric. Pay close attention to keep the fabrics flat and smooth. Fuse the wrong side of the second piece of fabric to the fusible coated wrong side of the fabric. Press well so all of the fusible material has melted to both pieces of fabric. Using rotary cutting tools slice the fabric into strips. If a serger is available, mark the width of the strips and use the serger to sew a rolled hem on the edges of the strips. If there is no serger available, mark or cut the fabric into strips. If the fabric frays, experiment with decorative stitches and zigzag stitching to secure the edges of the cut fabric. Some synthetic fibers can be "tamed" with a flame by gently melting the edges to stop the fraying but this is difficult to do on lengths of ribbon. To have the fabric face show on both sides of the ribbon, layer the strips of fabric with the wrong sides together. Cut the desired number of strips making each strip two inches longer than the one before. The strips shown in the photo will make a 4 layer bow. Cut a ribbon for the center of the bow, that is twice the width of the ribbon and a little extra to overlap the ends. Mark the center of the strips. Starting with the shortest strip, fold the ends into the center marking, allowing the ends to overlap each other. Glue or stitch the ends in place. Stack the loops on to of each other, graduating the sizes, with the centers stacked. Stitch or glue them in place. Wrap the center strip around the center of the bow, overlapping the ends. Glue or stitch the ends in place and to the back of the bow. 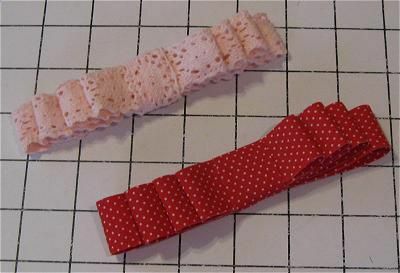 Attach a bobby pin, barrette, or appropriate backing for the purpose you are making the bow. Sew a Fun Cat Toy With Your Fabric Scraps!